NICE! Like the sturdy design of this set, easy to put together, nice addition to back yard, great eye candy! ...Peace. Ideal for any indoor or outdoor entertainment setting, this 3-piece cast metal bistro set from The Camellia Collection perfectly combines beauty with durable utility. Delicate floral designs add elegance and style to each piece in the set. 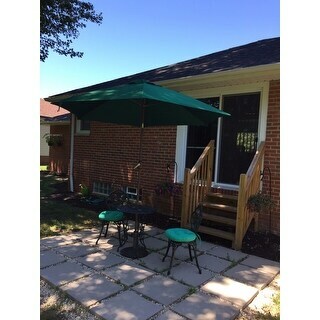 The round table has a traditional construction of sturdy cast aluminum and has an opening in the center to hold an umbrella. The two bistro chairs and legs of the table are finished in verdi green for the highest quality possible. This set includes 1 table and 2 bistro chairs. 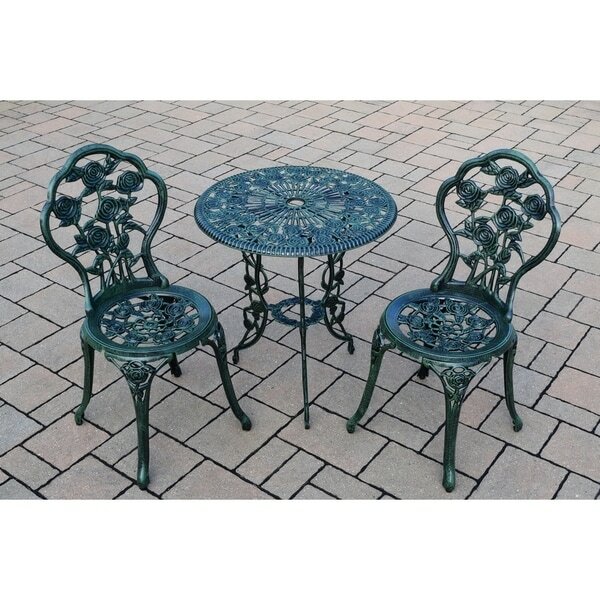 A solid, well made bistro table and chair set for your yard or patio. My wife had a resin one for years but it finally broke and needed replacement. We found this one online and she fell in love with it. It assembled easy and was clearly well made and durable. Well worth the price! The product is beautiful and appears well constructed. It seems to weather well. However, assembly was tedious and time consuming. I live alone and was very frustrated with all the many parts. The table was difficult to create the true center. The set has a cute look. It's very heavy and sturdy. Unfortunately, the chairs are very uncomfortable to sit in. The seat is too short. I'm not going to keep it. I'm trying to sell it...I've listed it on let-go.com. "Is this sturdy enough that a strong rain or strong wind won't blow it over? My patio is not covered and it faces East." "Where can I find the specifications on chair weight limits?" "can i buy extra chairs separately?" Unfortunately, the chairs are not currently available separately.